Tracing Islamic calligraphy through ages, an exhibition in the Turkish city of Istanbul is exploring the development of Islamic writings from the very early age to modern times. 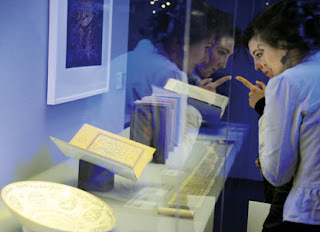 “The exhibition…traces the transition of Islamic writings from animal-skin parchment to paper, and from blocky, time-consuming print to a quicker cursive script and colorful illustrated texts,” commented The New York Times on Thursday, January 20. Hosted in Sakip Sabanci Museum, the exhibition “Treasures of the Aga Khan Museum: Arts of the Book& Calligraphy” provides a timeline that shows the transitions to different scripts and styles that emerged over time. Examples could be seen on materials including wood, metal, ceramics and textiles from North Africa to Iran and the Far East. The exhibit features examples of various writing styles preserved on a variety of materials, including luxuriously decorated and bound books, carved wooden beams, or even a blue-and-yellow silk robe. One of the most fascinating items on display is an Ottoman ivory and gold box, with turquoise and ruby inlays. “(It) is not only both valuable and rare, but of great historical interest (as well),” said the fair organizer. “It was made in Istanbul for Suleiman the Magnificent, by Iranian craftsmen working in Turkey,” said Benoit Junod of the museums and exhibitions unit of the Aga Khan Trust for Culture in Geneva said, referring to the longest-reigning Sultan of the Ottoman Empire. After Istanbul, the exhibition will travel next to the State Hermitage Museum, in St. Petersburg; the Islamic Arts Museum Malaysia, in Kuala Lumpur; and the Asian Civilizations Museum, in Singapore. It will culminate in a show at the Los Angeles County Museum of Art before the entire collection of more than 1,000 items is transferred to Toronto where it will find a more permanent home when the Aga Khan Museum opens in 2013.